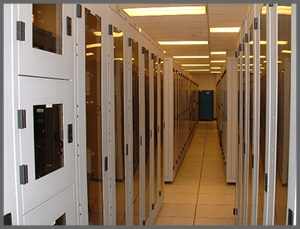 Automatic Protection Limited can offer solutions for fire protecting vital IT equipment and/or critical areas such as server and communications rooms. Standard fire suppression systems with whichever extinguishant agent is chosen (inert or chemical) would include “Double Knock” or coincidence operation detection, the required amount of cylinders c/w pipework and diffusers, the control panel c/w all associated alarms and signalling, Leak Detection if there is a risk of water spillage/ingress and Room Integrity Testing. However It is sometimes the case for various reasons, that it is impossible to protect the room, this is where APL’s DetExt F/F systems can be utilised to protect individual or multiple communications cabinets, racks, power supplies and UPS equipment.. It is recommended that in any case, consideration be given to HSSD (high sensitivity smoke detection) being utilised to give very early indication of smoke within the area. The basis of this system is keeping the Oxygen content below 15% by volume to ensure that a fire cannot even start. Therefore no damage can occur and is even more of an active solution than detecting fire and then putting it out. An aspirating system is installed as part of this unique system as even knowing that you cannot have a fire, you still would want to know if there was something overheating within the protected area.